YP Simplified Series – Reservoir Engineering: from Seismic to Surface by Mike Smith. 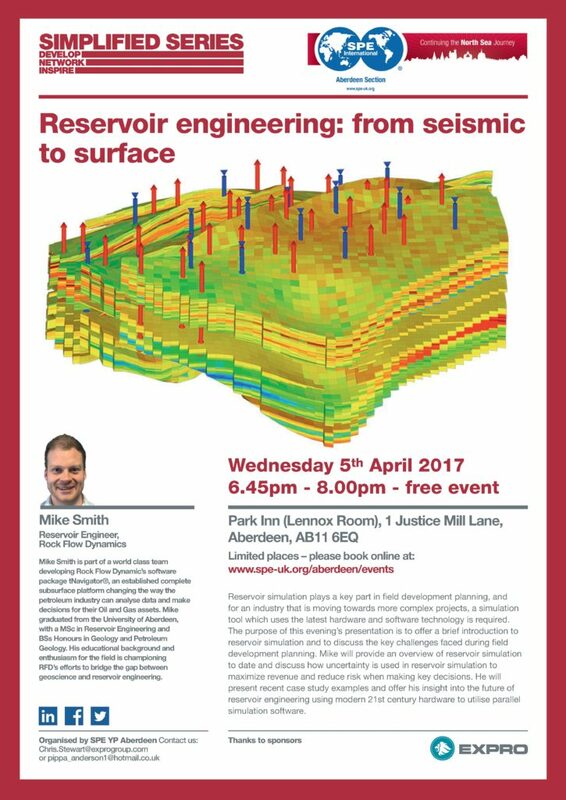 YP Simplified Series presents: Reservoir Engineering: from Seismic to Surface by Mike Smith, Reservoir Engineer, Rock Flow Dynamics. Mike Smith is part of a world class team developing Rock Flow Dynamic’s software package tNavigator®, an established complete subsurface platform changing the way the petroleum industry can analyse data and make decisions for their Oil and Gas assets. Mike graduated from the University of Aberdeen, with a MSc in Reservoir Engineering and BSs Honours in Geology and Petroleum Geology. His educational background and enthusiasm for the field is championing RFD’s efforts to bridge the gap between geoscience and reservoir engineering.